This issue recently re-surfaced for me. A few months ago, I was asked to present a historical lecture at First Presbyterian on the topic of the Church and Slavery. Since I’m a preacher and not a historian, I decided to limit the scope of the talk to the American Restoration Movement (that’s the history I know best). Turned out that someone with the Polk home was there and they asked me to repeat the talk at the Polk’s America Lecture series. They asked for a title and synopsis so here’s what I sent them. A Unity Movement Divided: The American Restoration Movement birthed the Churches of Christ, Christian Church and Disciples of Christ. It was essentially a unity movement designed to bring Christians together. However, just as the movement was gaining steam it ran headlong into the most divisive issue in our country’s history…slavery. Russ Adcox will talk about some of the principal leaders of the movement and how they sought to respond to the growing division. Apparently, a few folks saw the press release and emailed to the Polk home to take issue with the notion that the Churches of Christ we’re birthed by the Restoration Movement. I didn’t see any of the emails but I wasn’t too surprised. We actually have a history of denying our history. Sounds confusing but let me explain. The Restoration Movement was a unity movement that focused on calling Christians out of denominations and into simple, nondenominational Christianity. 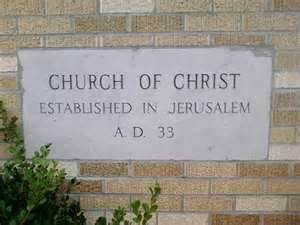 They sought to restore the church of the New Testament and reestablish the “ancient order of things.” Thus, there was a strong emphasis on the first century church and it’s beginnings on the Day of Pentecost. These restoration ideals carried with them the idea that our fellowship (unlike others) could actually trace its history all the way back to the book of Acts. Therefore, many members insist that the Church of Christ was established in the first century not the 19th century. And they are right…to an extent. If we’re talking about the church universal or the church as established by Jesus, they are right. It started around A.D. 33. But if we’re talking about the church as a specific sect, fellowship or group, then it started around the early 1800s. That’s clear to any student of history. The current beliefs and practices of the Church of Christ were heavily influenced by the Stone, Campbell and other leaders of the Restoration Movement. To admit that doesn’t diminish the role of the Bible. It simply recognizes that these men were the voices that called us back to the Bible. It’s a fascinating history that we should embrace rather than deny. ← Times are Tough…or Are They? I heard a preacher once say that Revelation 12:4b-6 “The dragon stood in front of the woman who was about to give birth, so that it might devour her child the moment he was born. She gave birth to a son, a male child, who “will rule all the nations with an iron scepter.” And her child was snatched up to God and to his throne. The woman fled into the wilderness to a place prepared for her by God, where she might be taken care of for 1,260 days.” Was the Church was established on Pentecost then when the last Apostle died and the church turned into what we now call the Catholic Church, God hid the true Church, but now God has brought the woman back as what we now call the “Church of Christ”.